Certified Packing & Training, Inc. is a full service packaging company benefiting the transportation and logistics industries since 1997. Our team of specialists offers solutions to all situations related to packaging, wood crating of general freight, frozen and refrigerated freight, sensitive electronics and hazardous materials shipping. Our goal is to lessen the burden of transporting hazardous materials for you. 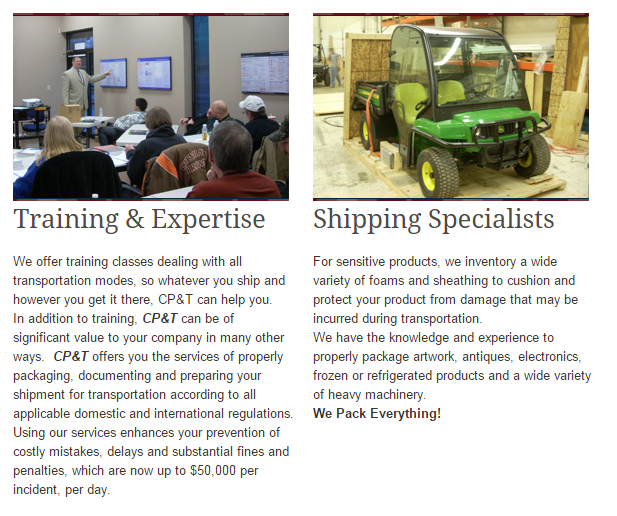 In addition to these solutions, CP&T is also a Certified Hazardous Materials Training Facility specializing in compliance training for all modes of transportation. Our full course list offers everything you need to stay in compliance with both federal and international codes like 49CFR, IATA, IMDG and ICAO.